A typical way to build a CD ladder is to build it all at once. Let’s say you have $12,000 and you want to build a ladder where you have a one year CD renewing every month. One way to approach the problem is to simply open a CD with one month, two month, etc. maturity dates, and then when the time comes to renew them, renew at a 12 month period. Of course it can be hard to find a seven month CD, so you may have to go to plan B and build it over time. My approach was simply to buy a 12 month CD every month until I had mine set up. You do not have to use one year CDs of course. You could use half as many six month CDs to get the same effects, although likely with inferior yields. Part of the logic of my ladder was that I had chosen “good” banks with which to do business, and I could simply let the CDs auto-renew. For a couple of years that worked fine. While I didn’t always get the best rate at renewal time, it was close enough that I didn’t bother changing it. The value of my time was higher than the difference in the interest. Unfortunately, once interest rates plummeted, I began having to move them around frequently. The amount of time it took to deal with all those CDs was absurd. Many banks make it very difficult to get your money back unless you are aggressive. The whole process was stressful and time-consuming. To make matters worse, once the banking crisis hit, some banks started trying shenanigans like offering ridiculous rates on CDs (lower than their savings account rates) in the hopes that inattentive people would renew and they’d get free money. I have had to be very diligent to make sure this doesn’t happen. I have since decided that fewer CDs is better, since the cost of dealing with them is the same regardless of size. Even when you don’t have craziness in the economy, banks still try to pull the wool over your eyes by offering “promotional” yields one year and then terrible yields the next. So you either have to deal with the hassles of moving your money around, or get a terrible yield. I have had some particularly bad experiences that I thought I might share, since it’s difficult to know which banks are good and bad. GMAC bank has done the best as far as not changing interest rates too much, however, because of this, I don’t know how difficult it would be to get my money back from them. They haven’t offered me an awful rate yet, so my money is still with them. E-Trade bank was fairly easy to get my money from, however I think that was aided by the fact I have a brokerage account with them, so I had more business to take away if they played any games. I had one CD with Indymac. Obviously I don’t have to warn anyone against using them since they’ve been seized by the FDIC and sold, but I had to spend a considerable amount of time making sure my CD wasn’t renewed when their interest rates dropped. I have saved the worst for last. Part of my motivation in writing this article was to warn people who are considering dealing with this bank. Although I had the most money with them and have dealt with them for the longest time, they have been simply awful since the banking crisis. They dropped their interest rates on CDs to 1% and then 0.75%. They have savings accounts that yield 1.5%, so clearly they don’t want my CD money. They have sent out letters offering to let you “get out” of your CD without penalty, i.e. lose your interest rate. Each time I’ve tried to keep a CD from renewing I’ve been told a different process was necessary-each more difficult and time-consuming than the last. Like so many others in the banking industry, they seem to be focused on the short term only. They are causing me stress and costing me time in an attempt to screw me out of a few dollars. However, when times were good, and they may be again, I was a customer with a considerable amount of money invested there. Do you imagine they’ll ever get my business again? Shop around for good interest rates. Bankrate.com has a good service for finding good yields. Favor fewer, larger CDs. You will spend less time dealing with the logistics of managing the same amount of money. Get information on bank customer service in addition to their interest rates. Your time is money, and you don’t want to spend a tremendous amount of time just to gain slightly higher yields. 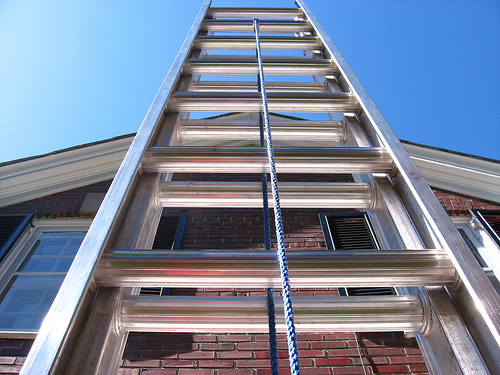 It can be easier to set up a ladder all at once than over time. Once you have the CDs set up, they will renew, reminding you to take action each month. If you set them up over time, you can forget one month and then have your schedule confused. In all, I still hope to establish a ladder that will represent my retirement income. But I’ve definitely changed my methodology. I hope I’ve saved you some time on the learning curve as well. Good stuff Brad. Indeed, laddering CDs is a nice way to set up some regular income. But as you noted, it has become quite a bit more difficult due to the perversely low interest rate environment — not to mention the ‘fear factor’ when it comes to which financial institutions you can trust these days. If any. My IndyMac CD had matured before most of the real issues came out. I also make sure to keep all the sums of my CDs under the FDIC limit and I have relative confidence in the FDIC. IF we get to the point where they’re defaulting we’re going to have a bigger set of issues. The real concern was when ETrade’s solvency was in question with regard to my brokerage account. I was not nearly as confident in the security, and more importantly the “smoothness” with which any failure would be handled. The FDIC does a good job of making its takeovers relatively seamless, I don’t really have any similar knowledge about say SIPC insurance. Plus not having access to your brokerage account with all the insanity going on, even for a short period of time, could have been horrifying. No doubt. I think ETrade lost more than a few customers in that debacle, including a few friends of ours.